Leah and I were browsing in Williams-Sonoma recently (which we shamelessly acknowledge is our favorite store) and happened upon Jeni’s Splendid Ice Creams at Home. It looked fabulous, and we’d heard great things about the book. We were out of cash at the moment since it was our last stop at the mall, but you better believe we ordered it as soon as we got home! 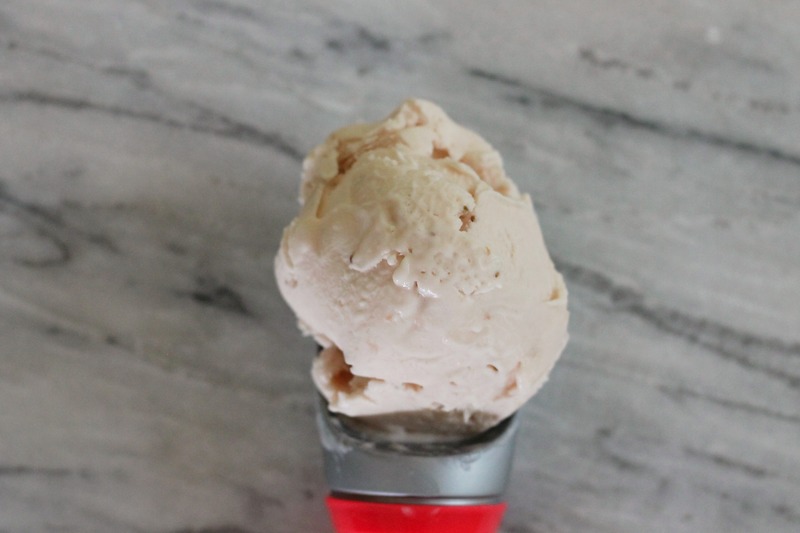 We had a recipe for strawberry ice cream on our blog, but we feel that this one is superior. The strawberries are briefly roasted to concentrate their flavor, pureed, and mixed into an egg yolk-free base. A bit of buttermilk is added as well for faint but pleasant tanginess. 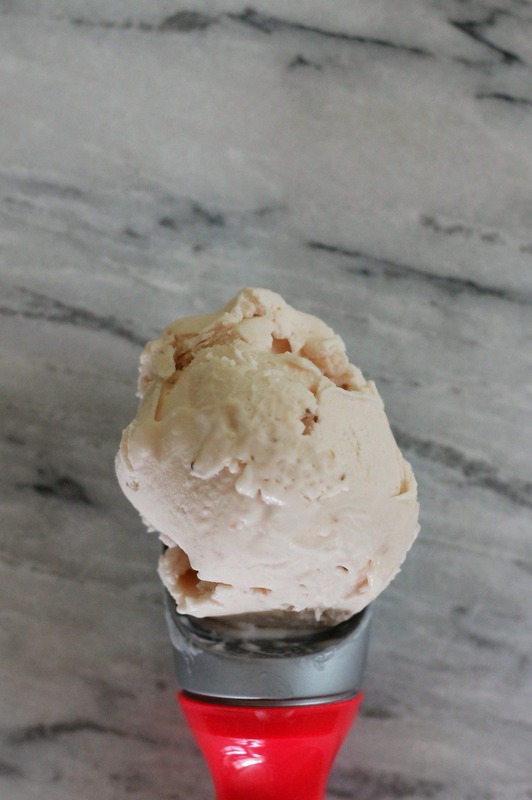 Almost every ice cream recipe in the book contains a small amount of cream cheese, and we think that this made the ice cream every bit as creamy, or possibly creamier, than ice creams with custard bases. Preheat oven to 375 degrees F. Combine the strawberries with the sugar in an 8-inch square baking dish. Roast for 8 minutes, or until just barely softened. Let cool briefly, then puree with lemon juice using a food processor or blender/immersion blender. Strain the puree, if desired (we skipped this step, since our puree was smooth enough). Save ½ cup for the ice cream, and refrigerate the rest (we recommend stirring it into lemonade!). Mix 2 tablespoons of the whole milk with the cornstarch in a small bowl. Whisk the cream cheese and salt together in a medium bowl until completely smooth (this will be easier if your cream cheese is very soft). Fill a large bowl with ice and water. Combine the remaining whole milk, the cream, sugar and corn syrup in a 4-quart saucepan and bring to a rolling boil over medium-high heat. Boil for 4 minutes. Remove from the heat and gradually whisk in the cornstarch mixture. Return the pan to medium-high heat and bring to a boil. Cook, stirring constantly with a rubber spatula, until slightly thickened, about 1 minute. Remove from the heat. Gradually whisk the hot milk mixture into the cream cheese until smooth. Add the reserved ½ cup of strawberry puree and the buttermilk and whisk to combine. Pour the mixture into a 1-gallon resealable freezer bag and submerge the sealed bag in the ice bath. Let stand, adding more ice if necessary, until cold, about 30 minutes. (We found this to be a very efficient method to chill the base, but we probably won’t do this every time as it is a waste of a plastic bag). Churn the ice cream base in your ice cream maker according to the manufacturer’s directions. Place in an airtight container and freeze for at least 4 hours before serving. Enjoy!